There is perhaps no more effective means of valuing silver than through the silver gold ratio. Historically, both gold and silver have been used as money and so expressing one by means of the other is a powerful valuation technique. Both silver and platinum are looking CHEAP relative to gold at the moment. Not only that, but silver has a history of overshooting its historical range in gold during periods of high inflation, such as the early 1980’s. Given that we appear to be on the verge of such conditions again, examination of the silver gold ratio would seem timelier than ever. Why The Silver Gold Ratio? Gold valuation ratios are used to assess the price of other assets and especially the other precious metals. I have discovered that the CPI measure cannot be trusted to value assets. The CPI distorts the measurement of inflation. So we need a clean measure of valuation and one way to do this is to price metals in a stable commodity. I particularly like to rebase using gold given its historical use as money.I started the analysis from January 1973. Although the data goes back further than that, gold was pegged to the dollar until 1973, which caused a distortion in the price before then. The United States was liquidating its gold reserves in order to artificially prop up the value of the dollar over much of the pre-1973 period. The line represents the price of silver divided by the price of gold, rather than US dollars, to produce a silver gold ratio. Silver has shown great volatility when priced in gold, especially in the early years after the gold peg was dropped. At one stage in the early 80’s, it went above 1/20 (0.05) of an ounce of gold, after reaching a previous mini-peak of 1/25 of an ounce of gold (0.04) in 1976. Since the mid 1980s, the silver gold ratio seemed to have settled in a range of 1/100 (0.01) to 1/50 (0.02) of an ounce of gold. Silver finally broke through this range to the upside in mid-2011. This run was later brought crashing back to earth, when the price of silver plunged from $50 to $25 per ounce. 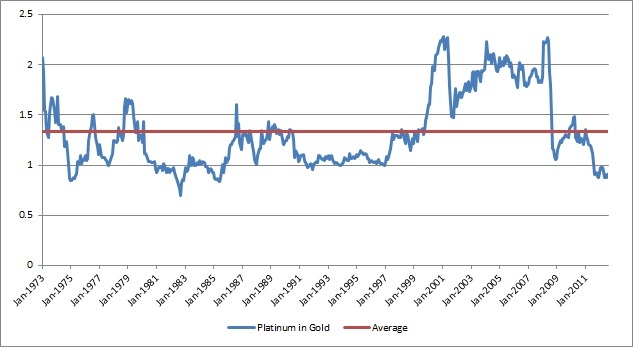 Platinum has been more stable than silver, with a 1X to 2X platinum gold ratio broadly maintained over the period. Platinum has higher extraction/processing costs than gold and so it is rare for the platinum gold ratio to be below 1, as it is at the moment. This only happens at times of economic distress such as 1974, the early 1980’s and the current period. The platinum price goes to double the price of gold during bullish markets. The most prolongued period above 2 has been during the 2000 decade, before crashing back in 2008. There should be little downside for the platinum gold ratio at these levels. As you would expect, silver & platinum are more cyclical than gold in their monthly movements at least. As central banks are engaged in a further round of quantitative easing and currency debasement, I suspect they will benefit more from the expansion than gold, until the inevitable correction comes. So is silver looking cheap or expensive relative to gold? 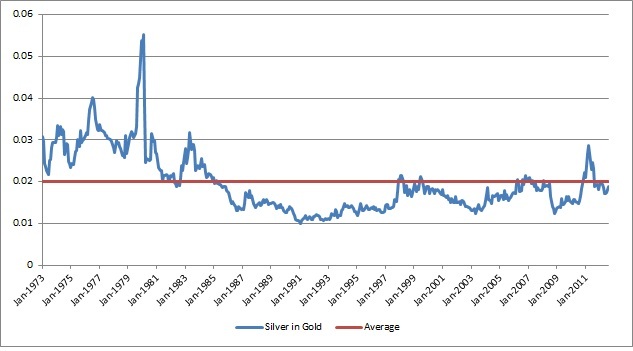 The silver gold ratio is looking in line with its historical average since 1976. It’s important to note however that silver had a higher valuation in the past (pre 1986 on the chart). It’s entirely possible that we will get a spike in the silver gold ratio during this bull market, like we did in 1980. In fact, this is my central expectation. I fully expect significantly MORE UPSIDE in silver than gold. Gold is looking VERY expensive relative to platinum at the moment. It’s quite unusual for the price of platinum to be below that of gold, given that the extraction/processing costs are higher for platinum than gold. It doesn’t look like a sustainable long-term valuation and hence one would expect platinum to OUTPERFORM gold as well.